Kendall Jenner was one of the only people who did not respond to her Pepsi advert. The reality TV star remained deafeningly tongue-tied while the commercial was eviscerated in countless think-pieces, memes, and parodies and then dropped by the company. But the model, who is the second youngest of the Kardashian clan, has now finally addressed highly controversial ad. Borrowing images from the Black Lives Matter movement, the “Live For Now Moments Anthem” was accused of commodifying and trivializing social movements to sell soft drinks and belittling the experiences of minorities enduring police brutality back in April. In a trailer for the 14th season of Keeping Up with the Kardashians, Jenner can be seen sitting on a bed discussing the backlash with her sister Kim Kardashian West. She can be heard saying: “It feels like my life is over”. Her sister did not mince her words, saying: “You made a mistake”. The premise of the commercial was neither complicated nor sophisticated. Jenner ditches a modelling shoot to join hoards of smiling young protesters. There, the 21-year-old hands an ice cold can of Pepsi to a riot officer who is monitoring the march, sparking raucous applause from the crowd and the policeman to flash a grin. The moment where Jenner approaches a line of officers is a clear reference to the iconic image of a female protester named Ieshia Evans standing stalwartly while being confronted by heavily armoured riot officers during a Black Lives Matter protest in Baton Rouge after Alton Sterling was fatally shot by police last year. 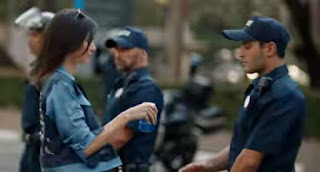 Pepsi was forced to bow to widespread criticism at the time and remove the video from YouTube. In a statement, they said: “Pepsi was trying to project a global a message of unity, peace, and understanding.